You probably know some common simple ways to save energy in your home. You likely make a point to turn off the lights when you leave a room. But there are many other small steps you can take that will save you a lot of money on your energy bill. Many of these tips are related to your HVAC service in Greensboro. Give these tips a try this summer and see how much you can save. Keep Appliances Away from your Thermostat. Many different appliances generate quite a bit of heat. Your television, if placed near your thermostat, could cause your AC to run more often. If your thermostat is located in your kitchen, the heat generated by your stove, refrigerator, and other appliances could confuse it. Either move the thermostat or the appliances, whichever is easier. Set your Thermostat for 78° Fahrenheit. This has been determined to be the optimal temperature for comfort and energy-efficiency. The closer the indoor temperature is to the outdoor temperature, the less often your air conditioner has to run. Use Ceiling Fans and set your Thermostat Higher. You can still feel comfortable at a higher indoor temperature when you keep the air circulating with ceiling fans. 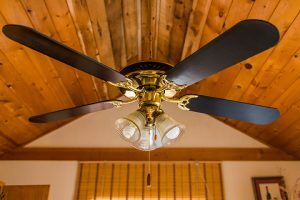 The amount of electricity needed to keep a fan spinning is less than what your AC uses to create cool air. Just remember to turn the fan off when you leave the room. It only serves you well when the room is occupied. Schedule Regular HVAC Service in Greensboro. It goes by many names from preventative maintenance to an AC tune-up, but every year your air conditioner should be serviced. This typically entails cleaning, inspecting, lubricating, repairing, and general tweaking of your system to make sure it is running properly. A properly functioning air conditioner runs much more efficiently, which saves you money. Have your Ducts Cleaned and Inspected for Leaks. Regular HVAC maintenance does not typically include duct inspection and cleaning. There is a good chance that your system is losing efficiency due to clogged or leaky ductwork. If your AC has just created cool air, but it encounters hot air that has leaked into your ducts, the air coming out of your vents will not be as cool as it should be. Get a Programmable Thermostat. The newest technology in HVAC efficiency is programmable thermostats. These gadgets allow you to preprogram your desired indoor temperature for certain times of the day. You can set it to be higher while you’re out and cooler while you’re home. You can set it to be cooler or warmer at night, depending on your sleeping preferences. And some even allow you to program them remotely using a smartphone or other device. Be sure that your AC is working as efficiently as possible by scheduling regular HVAC service in Greensboro. Berico can perform routine maintenance, check your ducts for leaks, and install a programmable thermostat in an ideal location. Call (336) 273-8663 to make an appointment today.